Hello sweet friends! Thank you for sharing in my excitement Tuesday about the completion of our very first room in our new house: our guest bathroom! 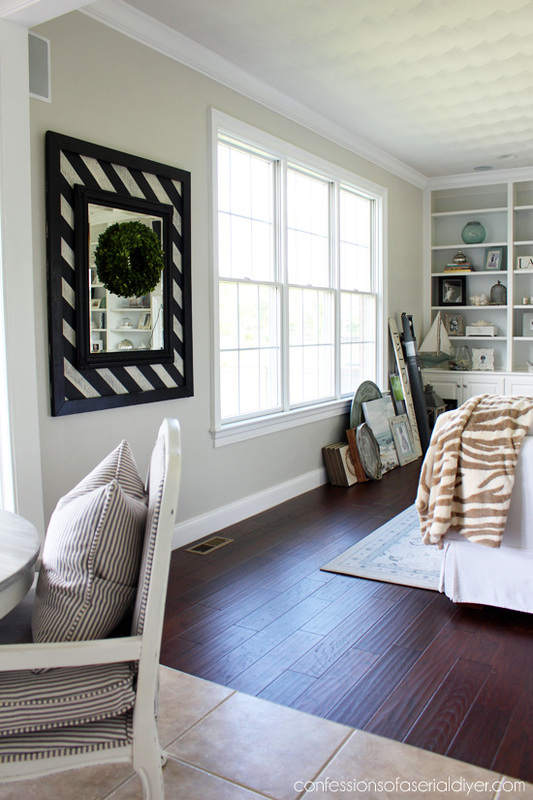 It really feels like a win to have one room done….one down, many more to go! Many also responded about being interested in a wainscoting tutorial, so I will gladly share that with you next week on Thursday! In other news, my sons had their first day at their new schools on Tuesday and would you believe that not just one, but BOTH of them got off at the wrong bus stops?? We never thought about that being an issue ha ha! My oldest had to use his GPS on his phone to make his way home. Luckily they were both in the right neighborhood, not too far away! Yesterday went much more smoothly! 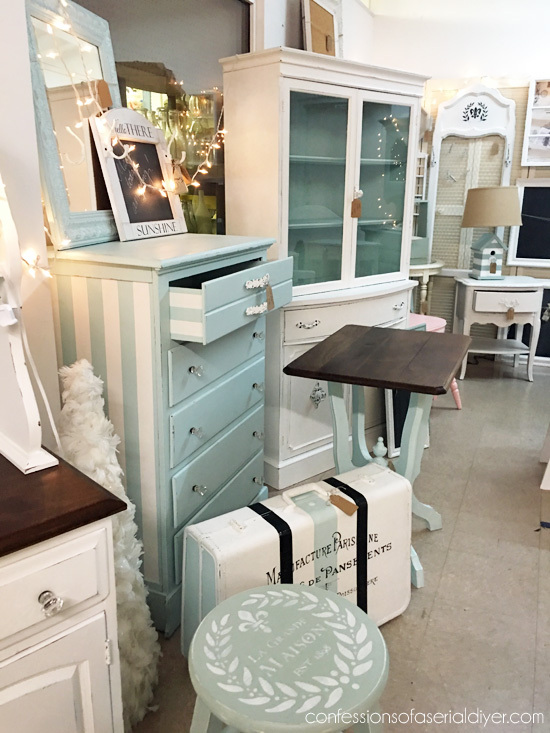 You can see the table makeover I shared recently HERE and the chairs makeover I did in the Spring HERE if you missed them. This set is working out perfectly in our new kitchen, but I needed two more chairs. The problem I was running into in my search, was finding just two that matched. There were lots of sets of six though! I had actually seen them once before but was sure I would be able to find something at one of my favorite thrift stores for much cheaper. When I saw them again, they had been marked down to $95. That’s way more than I hoped to spend, but a great deal for a brand new chair, and they had just two, so in the cart they went! Although these were brand new, I didn’t have any hesitation about taking a paint brush to them…they were gold, ya’ll. Really gold. First I spray primed both chairs, then I painted them with (affiliate link) Fusion Mineral Paint in Casement to match the table. 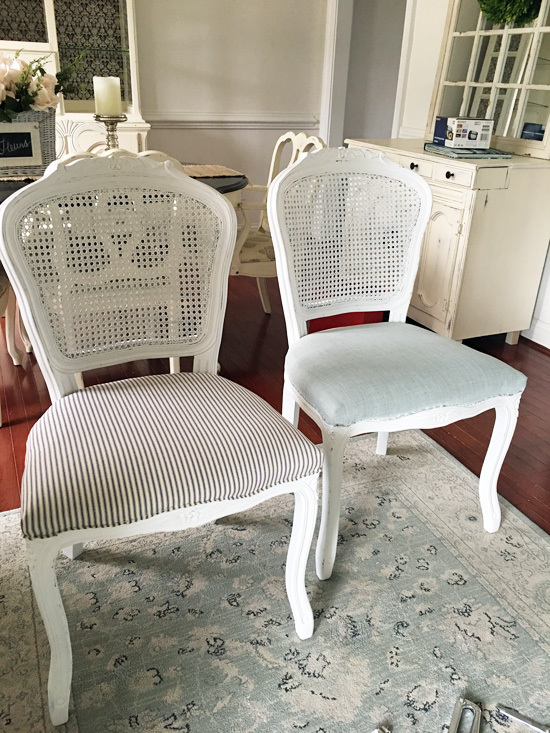 I like this paint because it requires no top coat, but since there is no sanding after, the finish isn’t quite as smooth to the touch as a chalk paint and wax combination, but I figured that would be just fine for these chairs. 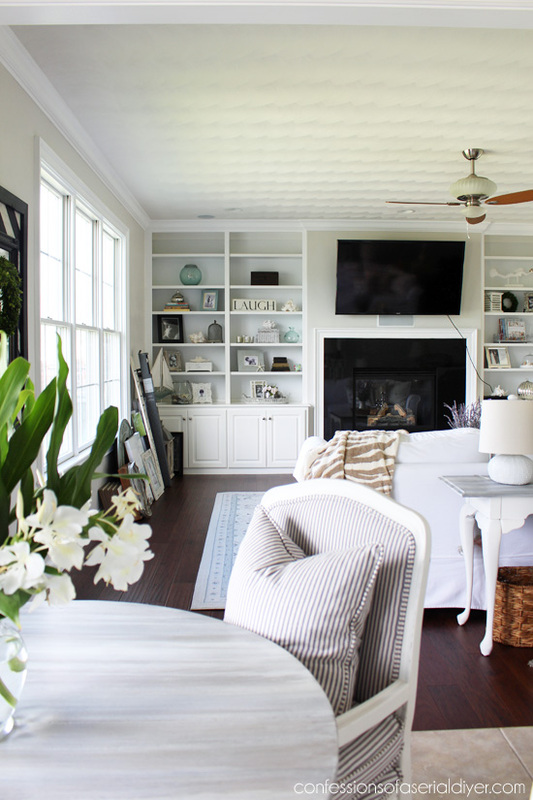 You can see I also grabbed several small things from my built-ins that were originally more ivory, to give them a fresh update as well. I don’t usually paint in the house, but it was SO incredibly humid outside and I was trying to get them finished before our cookout we had last weekend. 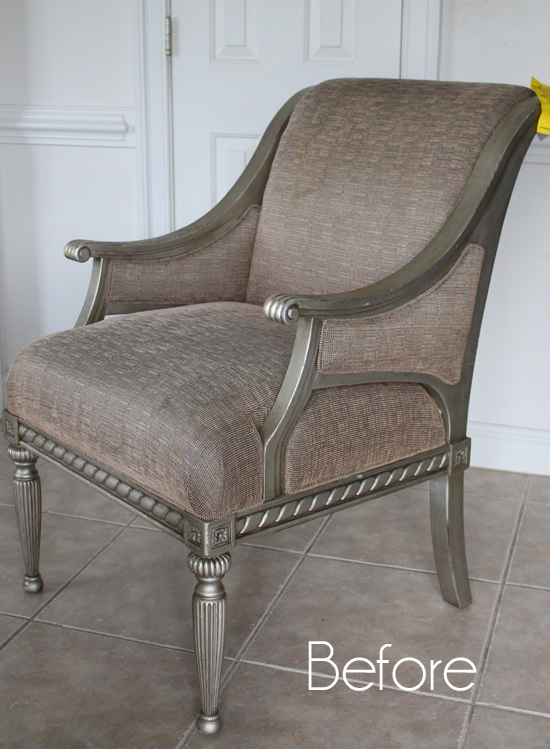 See my tutorial HERE to see how I recovered these chairs and made the piping. I actually really liked the original fabric with the white, though! Thanks to my sweet MIL for bringing me these beautiful fragrant blooms from her garden…just in time for these photos! Find my double welting tutorial HERE. 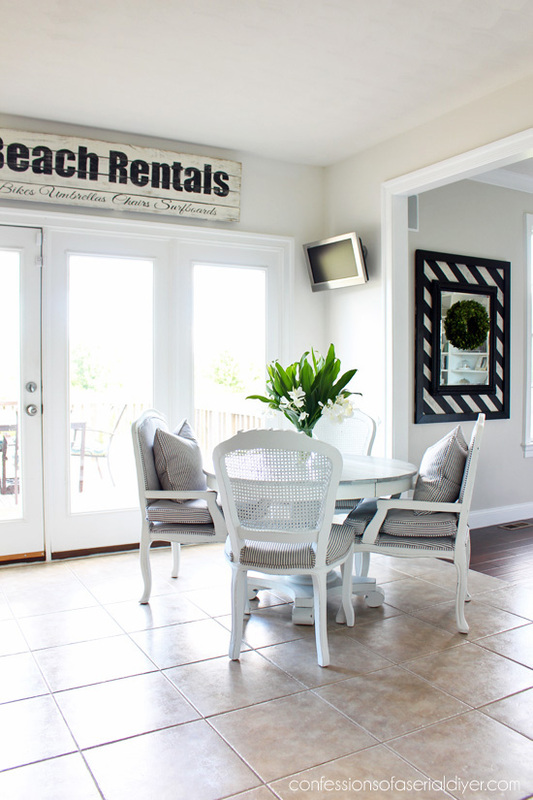 I decided to hang my “Beach Rentals” sign here above the doors. I think it works perfectly! See how I made that sign from an old fence panel HERE. I still need to paint in here, but I’ll just take it down before I do. That was a DIY project that was the result of a big fat fail! See that HERE. And don’t mind the little TV in the corner…that will be going soon. It is super tall so I am undecided if I want curtain panels (and if so, on just the outsides or in between each window as well?? ), roman shades, or should I just leave them as is? I’d love to hear what ya’ll think! 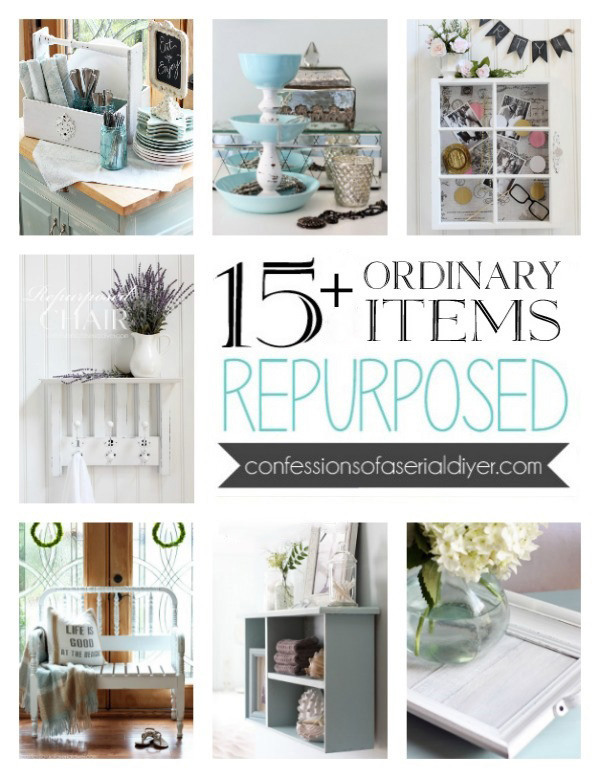 You will probably never ever see me redo a brand new piece of furniture again! I really hated paying $200 for two chairs I was going to have to redo, but in the end they worked out great. 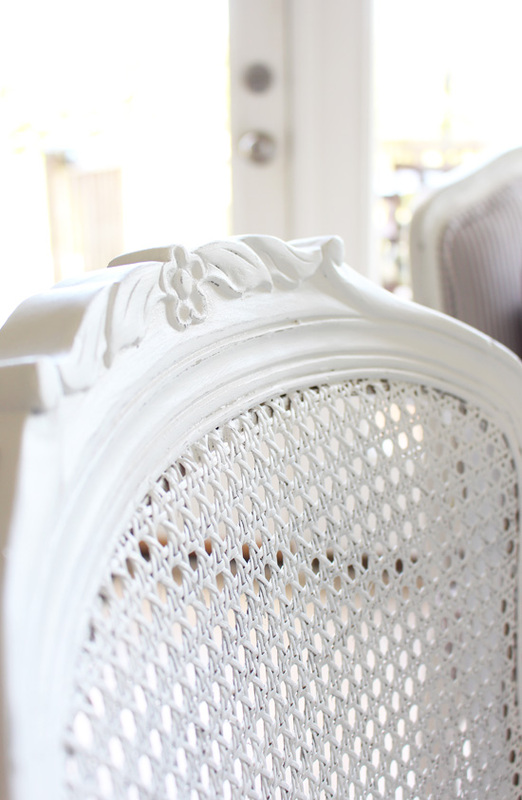 I’ll be back on Tuesday with my Trash-to-Treasure girls sharing a new thrifty makeover! Wow! Those are amazing. They really match the others so well. Well you paid for the new chairs, but it is so totally worth it in the end. You still do not have as much into the set had you paid full price for all of it. It turned out great, on to the next great project. You are amazing! You saved them! Lol. They look so much better painted white and I love! the black and white ticking on them. So.much.better! If you do curtains on the windows, just do on the sides. It would look cleaner and you could see out. Your chairs turned out great and the entire table set looks so pretty! Sometimes you just have to “bit the bullet” if you want to move on to other things and stop the “search” for your two last chairs. 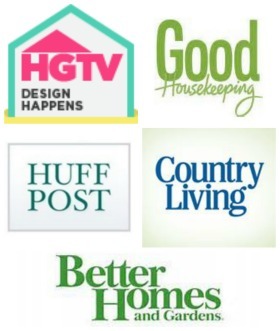 Look at ALL the other money you save on your decorating projects. You really inspire me to see “outside” the box of what something could be. I love the 4 chairs together. Awesome job. What a go-getter! 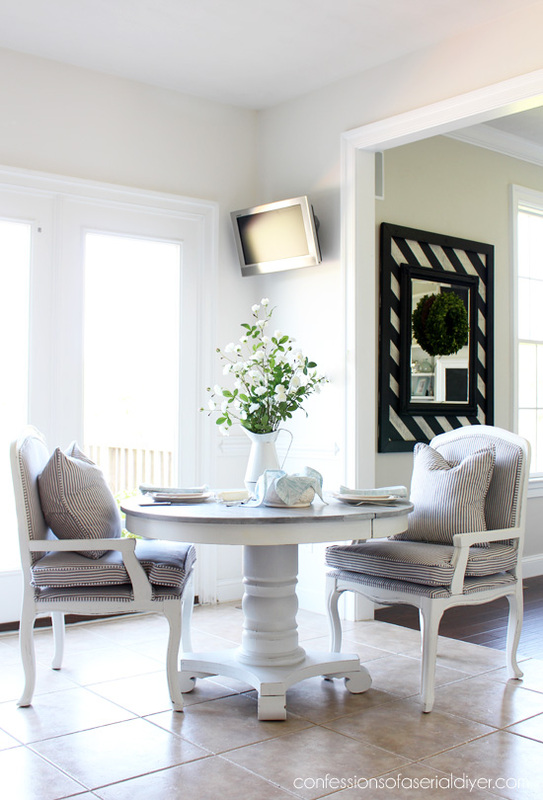 I absolutely love the table and chairs – just gorgeous!! 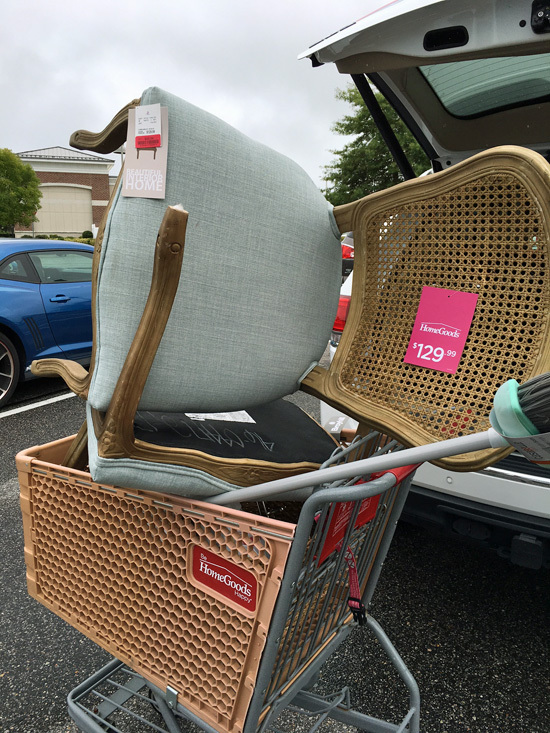 I wish I lived closer (I live in NC) to you so I could purchase chairs that you re-make – you amaze me! That mirror is such a statement piece – gives me an idea for a couple of mirrors that I’ve been holding on to. I like panels on a window because they make a room feel cozier, but that’s just me and not for everyone. Whatever you decide it will look lovely! a portion of it & your confidence. 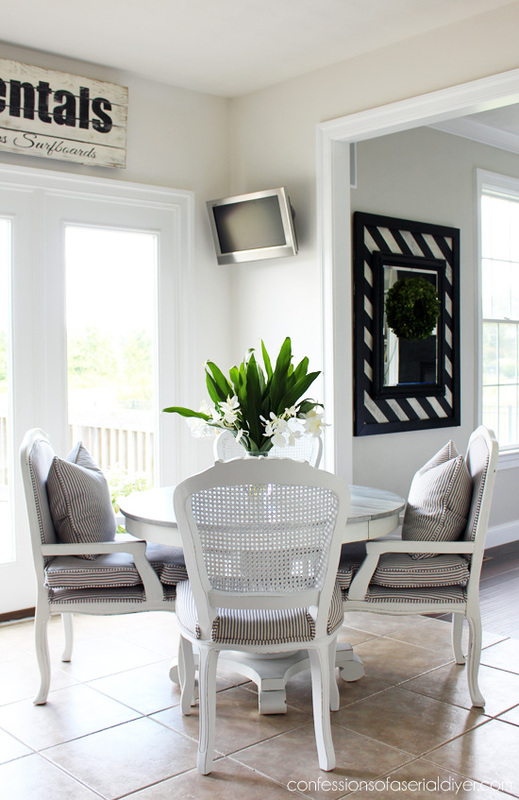 Love the recent dining chairs & table set. Question: Do you ever sell your finished projects? 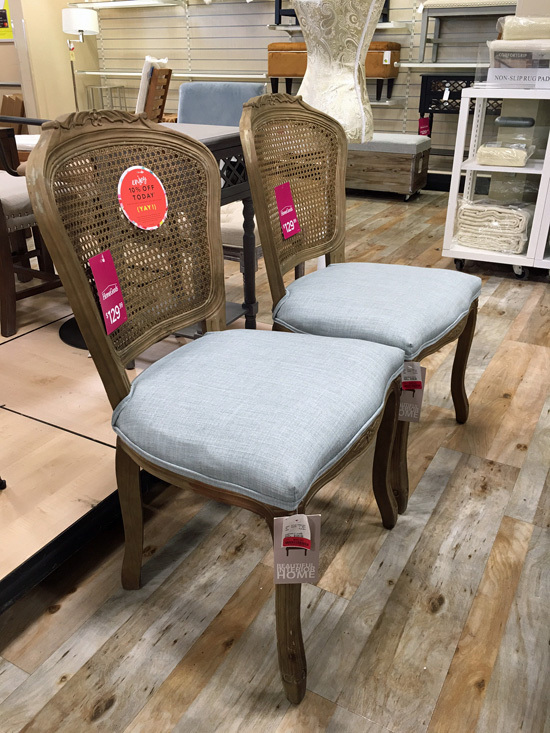 I LOVE the way paint and fabric unify this set of table and chairs – the furniture styles really coordinate, but you really opened my eyes about what paint and fabric can do. 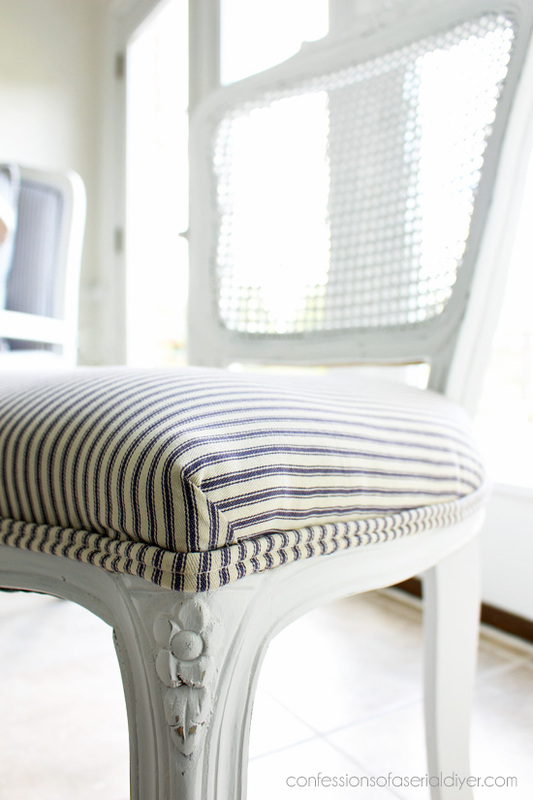 Simple changes for a very luxe look – gorgeous! Great job! These really made this set. I think the furniture companies should just hire you to design their furniture in the first place. Gold? Seriously? Christy, love the new chairs! You said you are having a hard time with the built-ins. 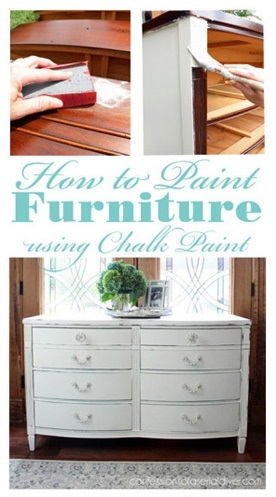 Have you thought about painting the back wall of the built-ins a different color? I’m thinking Sunken Pool would make a nice little pop of color! LOVE IT! What a great set you have now! Love everyone of your projects! Thx for sharing. The chairs are amazing! I think of furniture I had years ago and could have done something similar. Love visiting your blog to see what magic you are creating! Roman shades! Keep the walls simple. And don’t stress about the shelves. Put things you love and it will look wonderful. Look for some darker objects around the house, too, to reflect that marvelous floor. Or maybe it’s that big expanse of white bugging you – how about wallpapering the back or painting it a darker color to show off all your white treasures? Ahem, back to the chairs. Magnifique! I can imagine your hesitation about buying them, especially that gold! But they look fabulous and now you can spend time doing other things besides looking for the right chair (kinda takes over your brain, right?). Did you take off the seats or work around them? That shape looks tricky. Looking great, love seeing all the new decor. I agree that it is hard to style bookshelves when every shelf is short. No matter what you do, everything feels “lined up.” You might consider taking out a chosen shelf or two on each side, so that you can have tall areas to play with. I love your vision for what something can be. These are beautiful. For several weeks, whenever I click on your link in Facebook, it spins forever before the blog post finally completely renders and I can scroll down. Even typing this comment, is slow going. Any ideas why? Thank you, Donna! I’m not sure why you are having trouble with my blog loading? Are you on a mobile device or a desktop computer? You make it look so simple. 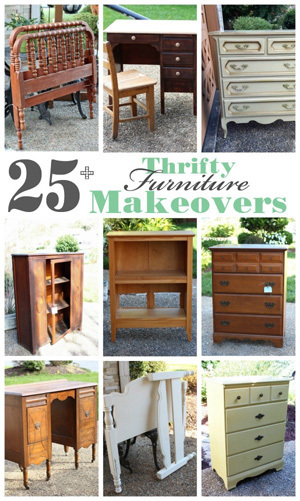 Since I have been following your work I have been inspired and have become addicted to thrifting makeovers. I look forward to your emails with new makeovers and find myself checking for new ones every day. I absolutely love everything you share. Keep it coming! 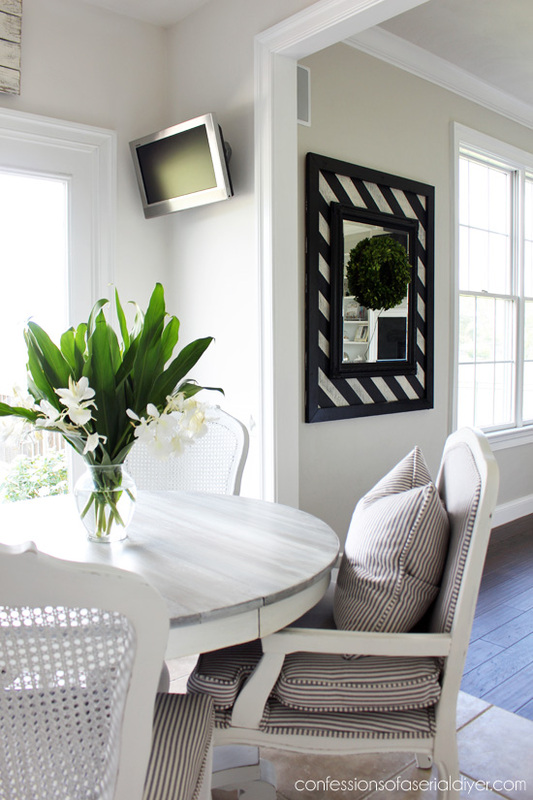 Is that a small tv mounted high on the wall in your breakfast area? If so, how did you hide all the wires that connect it to the electric/cable/satellite source? Hi Tara! That is a small TV. It was already there when we moved in, so I’m not sure how they did that…sorry! 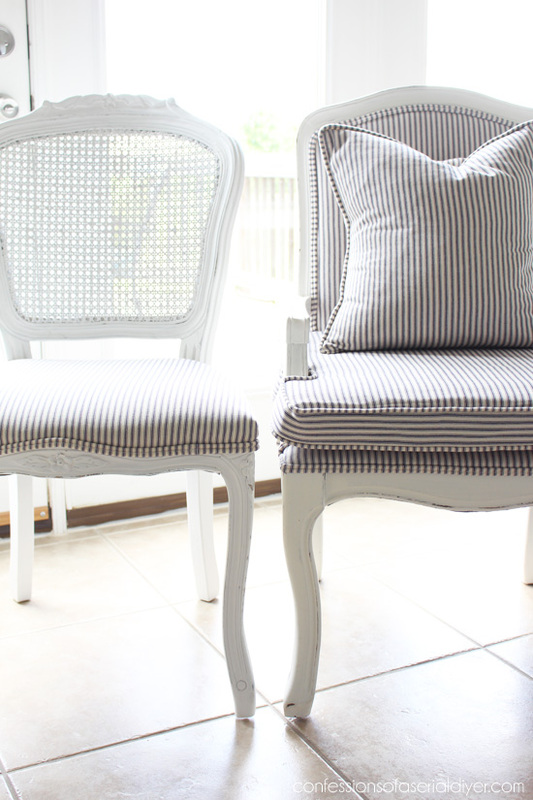 The lines in those chairs really do work well with the armchairs – so much prettier now. 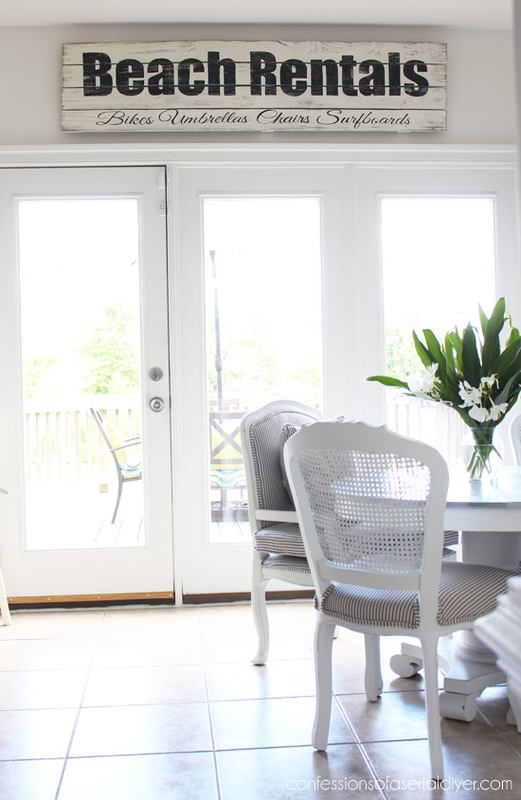 The beach sign above the garden doors is perfect, considering they lead to your deck and pool. 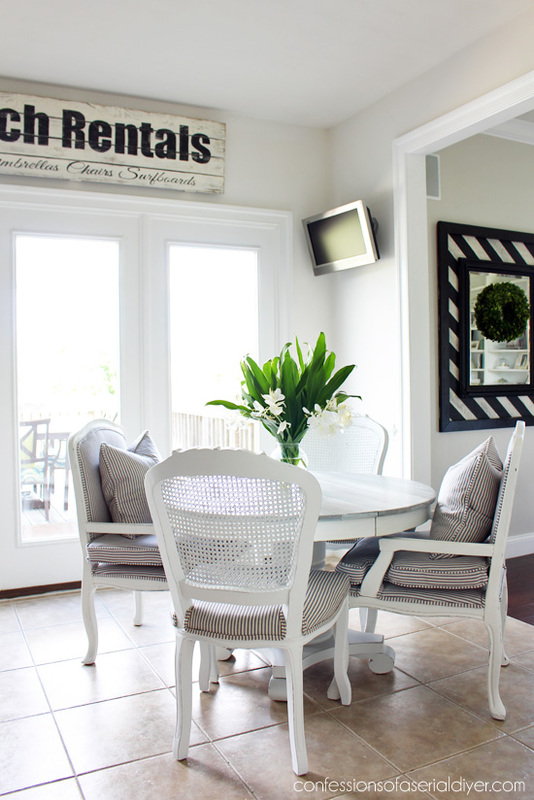 I love how bright your family room is so my suggestion would be a light sheer on either side just to soften the window. Nice style chair you’re sharing on Thursday, can’t wait to see what you did with it. I think wood shutters for those windows would look great & fit in well with your decor. Huge transformation! I love how they blend with the other chairs to add lots of interest at the table. Super job! These chairs couldn’t be a more better fit! Christy, You are so clever! 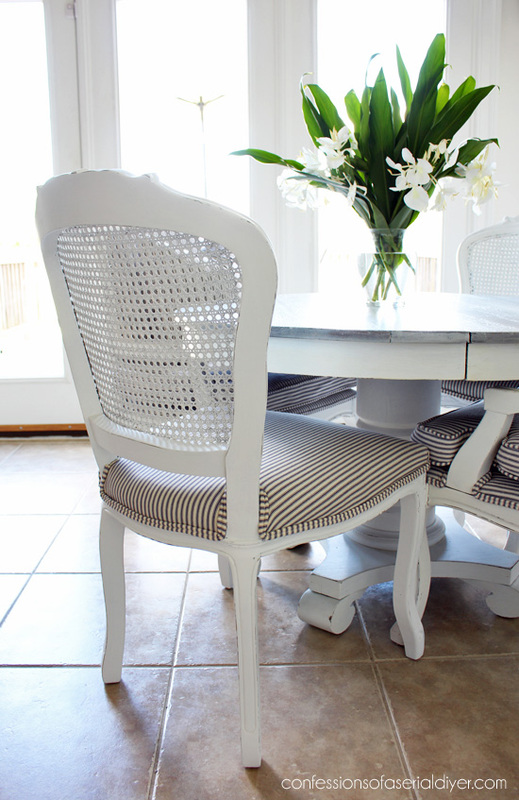 The newly recovered chairs are super paired with the older chairs at the kitchen table — what a success! Congratulations on your new home! Is white your go-to color? I love your table and the chairs are perfect. You have such a great eye. Maybe go with the roman shades for that window depending on how much sun you get certain times of the day? I have a sliding door that at times will have blinding sunlight and no way to cover it. Just a thought. I look forward to your makeovers each and every week! You are so very talented. Oh! You know I love a good French chair. I’m going to have to watch Homegoods. I keep waiting for some to appear in my local thrift but haven’t had a lot of luck. I love the way the chairs look now. Was not too impressed with them before. Your home is lovely. I met you today at my yard sale. I love your kitchen table and chairs. Good luck with your new home and welcome to the neighborhood. 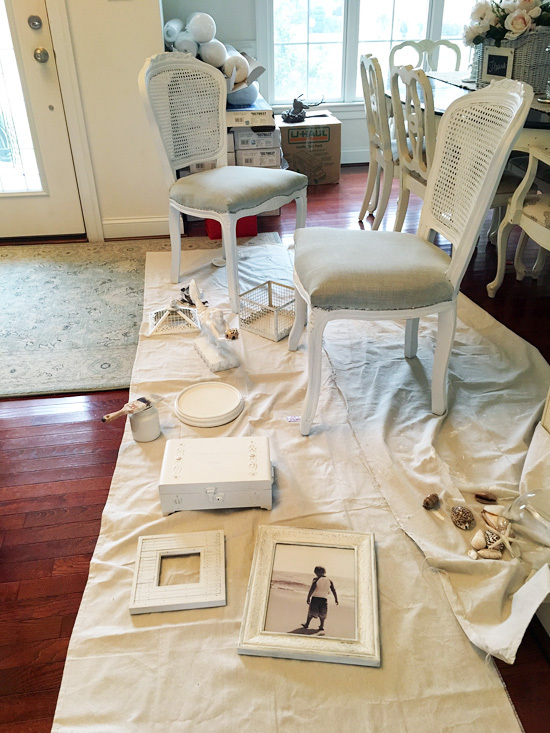 The chair redo is amazing…. such a beautiful addition to the room ! Love everything you do. What a GREAT find and upgrade to the chairs. At first I was skeptical that you could improve the chairs. I thought the wood was natural, not icky gold, LOL. 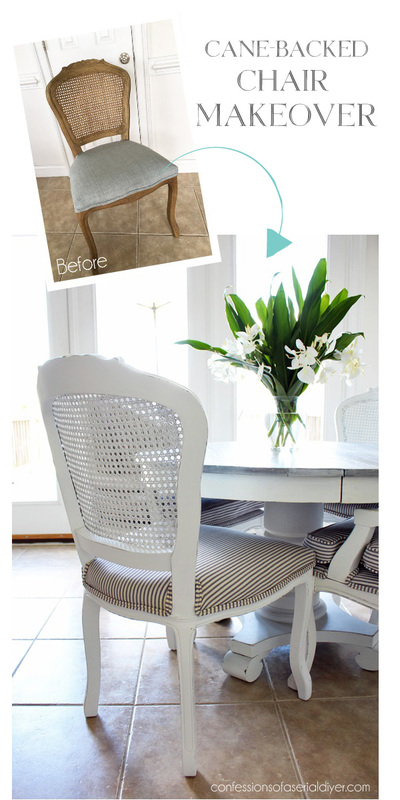 Your makeover is delicious, and the match with your existing chairs is perfect.